When they break, often being manufactured by casting, they are impossible to fix. When a part on them fails, you often need to buy the whole manifold, and sometimes finding one is impossible even if you can ignore the cost. Here’s how to Make Your Own Compressor Manifold, then. This is a self-help page for folks that have a broken or damaged compressor manifold and what to know how to make your own compressor manifold. After reading the page, if you have a question about building a manifold, post it at the end of the page. We’ll help if we can. By compressor manifold I am talking about the part, typically cast, that connects the compressor tank to the discharge coupling on the compressor. In that manifold the compressor regulator is typically found. 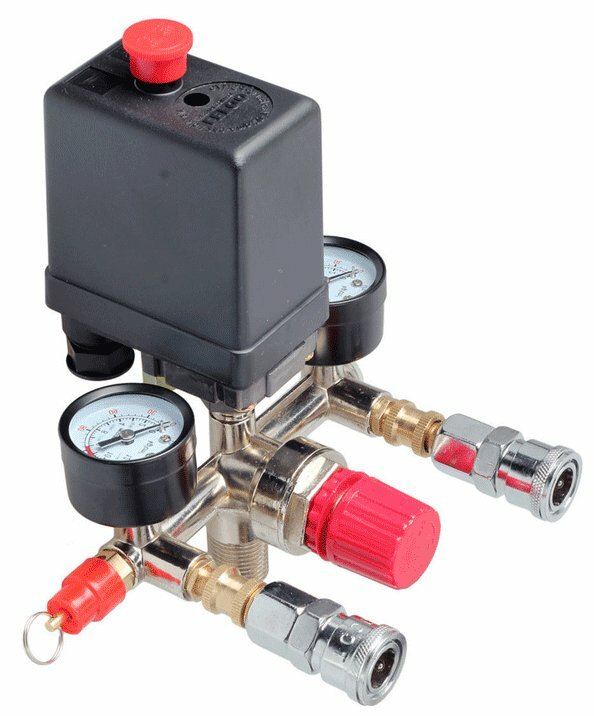 Or, another compressor manifold may have many components, including the pressure switch, the PRV, discharge coupler and gauges attached to it. The thing is, components on the manifold will fail or the manifold itself may fracture. When it does, do you have to replace the whole compressor manifold to replace one part? That is wasteful and possibly unnecessary. The solution is to make your own compressor manifold! Comprehensive and expensive compressor manifold. Maybe make your own compressor manifold instead of buying a new one? The idea is to use relatively easy to obtain parts, from plumbing houses to higher quality hardware stores, or acquiring the fittings on line, to create a manifold that works the same way as the original. No, when you make your own compressor manifold it will not look the same, and you may even have to permanently remove part of a compressor covering to install the new manifold. That being the case, your choice is a pretty compressor that doesn’t work, or one that works and doesn’t look new. Your choice! It will be necessary to determine the thread and female port sizes of the existing manifold. They may either be metric or NPT. Visit the Compressed Air Fittings page on this site for information about thread sizes if the existing manifold sizes are not known. The next step will be to acquire a selection of fairly common brass fittings. Select an assortment of fittings. 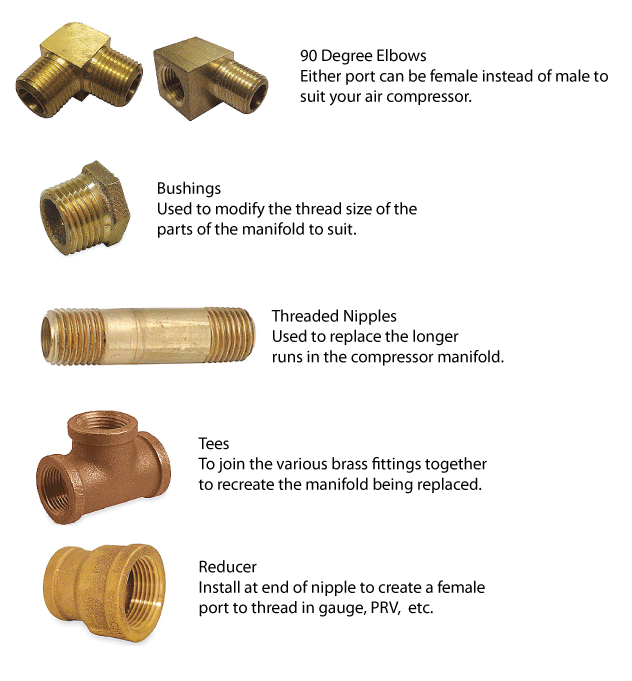 Use these fittings to emulate the size, shape and function of the existing compressor manifold. As long as you recreate the same function of the old manifold, and you can install it on the compressor, you can change the shape and orientation of the ports and locations of ports on the new to suit your own preference. Perhaps you want two discharge couplers, for example? Perhaps the PRV is in the way where it is presently installed? Change a little or change it all. It’s up to you. Or more frequently, interference between one part or another on the manifold and the compressor makes removing and replacing it difficult. If that is the case, add a union or two to your new manifold. This will enable faster and easier disassembly of the manifold without having to turn parts that might interfere with the compressor. Brass unions will make dis- and reassembly of your manifold quick and easy. 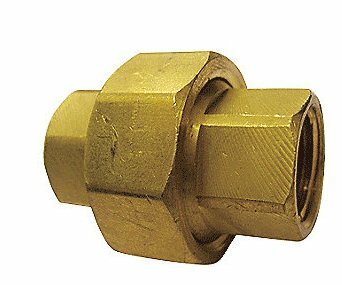 Brass fittings are easily obtained on line or at good stores, are relatively low cost, and with a bit of thought can be used to make your own compressor manifold, perhaps for a fraction of what a new OEM version would cost. If the existing manifold cannot be found, making one yourself, regardless of the cost, can get a broken compressor back into use, fast! I do not know what the compressor manifold on every air compressor looks like. I do know, having done so myself, that you can use standard, off the shelf, brass fittings like those shown to recreate virtually any compressor manifold. In future then, when the next component fails and needs to be replaced, doing so is relatively easy. You didn’t simply buy an expensive compressor manifold off the shelf, but took the time to build your own with readily, and long term accessible, available parts. To ensure that your home-built compressor manifold does not leak, I recommend the use of a paste type thread sealant on all connections. Make Your Own Compressor Manifold question? Please add your question here, and be sure to upload photos as they almost always help others help you.